Under-five mortality rate (per 1,000 live births) in India is staggeringly high (forty-eight) compared to developed countries (Ireland and UK- four) (World Bank, 2016). Such a high mortality rate is mainly because of avoidable causes, for example, pneumonia and diarrhoeal diseases account for fifty per cent of all deaths at ages one to fifty nine months in India (Million Death Study Collaborators, 2010). This clearly signifies lack of health care access in India. This study attempts to understand the role played by the number of children in a household in making children resilient to poor health. This has been done by comparing the incidence of medical poverty in households with no child, one child, two children and three or more children, where medical poverty has been defined as a state when a non-poor household falls below the poverty line after incurring health expenses (Xu, 2005). The poverty line has been defined as subsistence spending. The household subsistence spending is the minimum requirement to maintain basic life in a society (Xu, 2005). At present, very limited studies exist in the literature on medical poverty, also referred as the impoverishment effect (Kronenberg and Barros, 2014; Xu, 2005). This study does not just add to the scant literature on medical poverty, but rather this is the first study that attempts to associate medical poverty with the number of children in a household. This could indeed provide crucial policy suggestions for framing health care policies for the Government of India (GOI). 1.6 Subsistence expenditure is estimated as 1 6 Subsistence Expenditure. A household is considered poor when total expenditure is less than subsistence spending and can be written as 1 6A. A non-poor household falls into the trap of medical poverty when it becomes poor after incurring out of pocket (OOP) health expenses. Health expenses include both institutional (inpatient) as well as non-institutional expenses (outpatient). Let poor_medical be the variable created to reflect poverty impact of health payments. It takes the following values 2 Non Poor Household. Association between medical poverty and the number of children has been estimated using descriptive statistics and the Pearson chi-square test (Pallant, 2013). STATA 14 has been used for analysis. Figure 1 below depicts percentage increase in the incidence of medical poverty compared to households with no child. The incidence of medical poverty increases only slightly in case of households with one or two children compared to households with no child. However, the incidence of medical poverty in households with three or more children increases by a substantial twenty-three per cent when compared to households with no child. 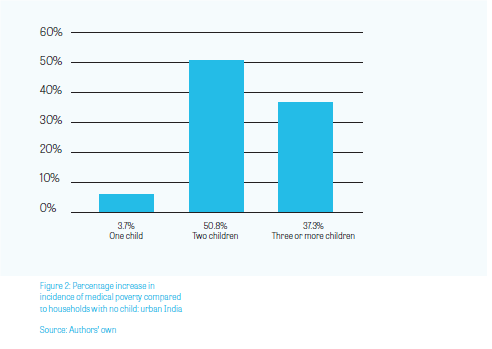 This clearly suggests that in India, medical poverty is a concern for larger households with the need for government to protect households with three or more children. The results of Pearson chi-square also suggest that there is a statistically significant association between number of children a household has, and if a household falls below the poverty line because of health expenses or not (chisquare=22.42, sig<0.01). The all-India results suggest medical poverty to be of concern for households with three or more children; the results of rural and urban India give some important insight into this result. In rural India, the incidence of medical poverty has not been found to be much different in the case of households with no child (5.6 per cent), one child (5.6 per cent), two children (5.1 per cent) and three or more children (5.9 per cent). The Pearson chi-square test has, however, been found to be statistically significant at five per cent, suggesting a statistically significant association between number of children in a household in rural India and the household falling into medical poverty (chi-square=9.58, sig<0.05). This is primarily because of the difference in incidence of medical poverty of households with two children and households with three or more children. more children, both have been found to have a high percentage increase in medical poverty compared to households with no child. Such result is expected as in an urban setting, raising a child is more expensive. The Pearson chi-square test has also been found to be statistically significant at five per cent, suggesting a statistically significant association between number of children in a household in urban India and the household falling into medical poverty (chi-square=10.29, sig<0.05). The results from all-India and urban India have suggested that medical poverty is a cause for concern for big households. However, it would be extremely important to know if this phenomenon is limited to just low-income households or high-income households as well. For the same purpose, this study estimates the incidence of medical poverty for quintile one (poorest twenty per cent) and quintile five (richest twenty per cent) households. Expenditure has been taken as an approximation of income to estimate quintiles, by following previous literature (Pal, 2012). The results are shown in Table 1. As expected, quintile five households have been found to have virtually zero per cent incidence of medical poverty, irrespective of number of children in a household. This clearly suggests that raising more children is not a concern for wealthy households. In the case of quintile one, though absolute incidence of medical poverty differs only by a small percentage points in the case of families with no child, one child, two children and three or more children, the percentage increase in incidence of medical poverty compared to households with no child has important implications. The incidence of medical poverty in the case of households with three or more children increases by fifteen per cent compared to households with no child. The incidence of medical poverty even increases by twenty-six per cent and eighteen per cent in the case of households with one child and two children compared to households with no child. This clearly suggests that for the poor, raising even one child makes them extremely vulnerable to falling below the poverty line. The association between number of children and medical poverty seems to be valid only for low-income households and not rich. This association has also been supported by results of Pearson chi-square test which has been found to be statistically significant at ten per cent in case of quintile one (chi-square=6.37, sig<0.10), while it has been found to be statistically insignificant in case of quintile five households. This study has attempted to understand the role played by the number of children in a household in making children resilient to poor health . This has been done by comparing the incidence of medical poverty in households with no child, one child, two children and three or more children. rural or urban, households with three or more children have a higher incidence of medical poverty compared to households with no child. Children in the poorest twenty per cent households are the most vulnerable where even raising one child makes a household extremely vulnerable to falling below the poverty line. 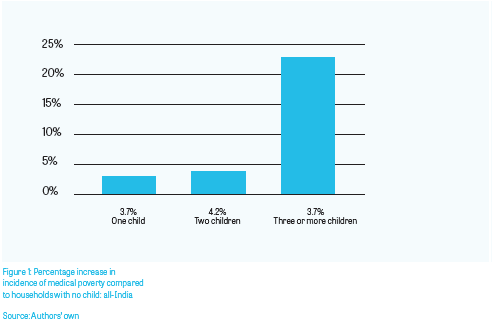 Making children resilient to poor health would require extra support for larger households in India, especially for urban India. This support may come in the form of different health care schemes for larger households from the Indian government. The importance of government initiatives such as vaccination programmes, clean water and nutrition cannot also be emphasised enough in making children resilient to poor health in urban India. This study also reflects on the need for urban Indians to have health insurance, especially for households with more than two children. From a different perspective, this study also points towards the need for India to control population growth, being already the second most populous country in the World. 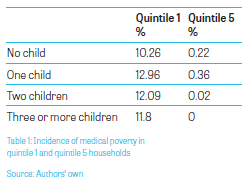 The slight difference in incidence of medical poverty as per different number of children in a household in rural India could be primarily because of two reasons (Brown, Hole and Kilic, 2014; Somkotra and Lagrada, 2009). Firstly, people in rural areas, especially poor, prefer public health services over private ones, wherein the latter is much costlier, thereby reduction in medical expenses and hence less likelihood of falling in medical poverty. Secondly, many poor do not access health services because of concern for incurring health expenses. For this reason, such households are not falling into medical poverty but their condition is perhaps worse than those in medical poverty. India is in a bad state. Only sixty-one per cent of children (two to twenty-three months) are fully immunised (GOI, 2014b), leaving them extremely vulnerable to fall sick and catch diseases at a later stage in their lives. This indeed increases health expenses of the household, making them vulnerable to falling below the poverty line. 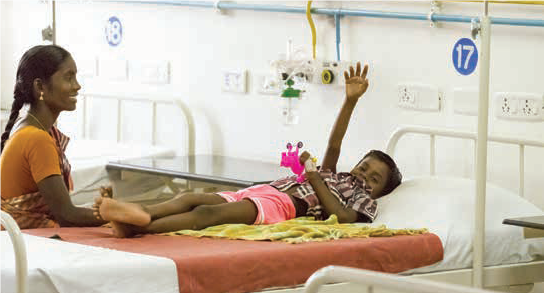 The draft national health policy 2015 (GOI, 2014b) has laid out one of its objectives as to assure the universal availability of free, comprehensive primary health care services for all aspects of child and adolescent health and the most prevalent communicable and non-communicable diseases in the population. Such an objective is a welcome move for children in India. However, it would be only over the period of next few years that it will be realised how far the government has been successful in materialising its objective. Given the poor quality of public health care services in India (Bali and Ramesh, 2015), achieving good quality universal health coverage is nearly impossible for India in the short-run. However, making different health policies for households with different number of children may indeed put India on a faster pace towards achieving the goal of healthy India. Bali, A. S. and Ramesh, M. (2015) Mark Time: India’s March to Universal Health Care Coverage. Social Policy and Administration, 49(6), 718-737. Brown, S., Hole, A. R., & Kilic, D. (2014) Out-of-pocket health care expenditure in Turkey: Analysis of the 2003–2008 Household Budget Survey. Economic Modelling, 41, 211–218. Kronenberg, C., and Barros, P. P. (2014) Catastrophic healthcare expenditure–drivers and protection: the Portuguese case. Health Policy, 115(1), 44-51.
a nationally representative mortality survey. The Lancet, 376(9755), 1853-1860. Pallant, J. (2013) SPSS survival manual. McGraw-Hill Education (UK). Pal, R. (2012). Measuring incidence of catastrophic out-of-pocket health expenditure: with application to India. International journal of health care finance and economics, 12(1), 63-85. Somkotra, T., & Lagrada, L. P. (2009) Which households are at risk of catastrophic health spending: experience in Thailand after universal coverage. Health Affairs, 28(3), w467-w478. Xu, K. (2005) Distribution of health payments and catastrophic expenditures methodology.